As is our wont, from time to time we have a bit of a chocolate pig-out, with varying brands and types of chocolate. The latest one was extremely unsatisfying. The hazelnut Cadbury just didn't feel or taste right, so we had a look at the ingredients list on the new packaging and found that the composition had been altered. When I flashed the Mini 2140 yesterday I used a Windows laptop to create a bootable flash drive with the BIOS utility and update on it. I didn't really need to use a non-free operating system, as HP provide a tiny bootable ISO image with FreeDOS, but using that means wasting a CD-R. It's not that those are expensive, but they do end up in landfill. Instead, I'd like to be able to simply use a USB key. I found some help on the FreeDOS wiki and I thought I'd document the steps I followed on Ubuntu. When working on a Drupal site for a client earlier today I had an odd problem. The client wanted a page that lists downloadable files and has a little blurb about the downloads at the top, so I duly created a view that lists all published nodes of type 'Download' and sticks some HTML at the top. Read more about Drupal Views. Too powerful? Kattekrab has been lusting after a netbook for ages. Her old laptop, a G4 iBook, just isn't cutting the mustard anymore and Ubuntu even dropped PPC support some time ago. It runs Debian just fine, but even then because it's PPC there are issues with Java and there is no Flash or Acrobat*. Last weekend we decided to put our free** Rudd money into the economy and went shopping. Ever since my Dell disintegrated in the early naughties I've had HP laptops and loved them. 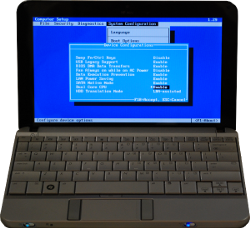 During 2008 I used a small HP laptop that was donated for linux.conf.au (the 2009 team used and loved it last year). Thank you HP! Ever since the explosion on the boat full of Afghani refugees, the news has been full of scaremongering again. They're faithfully reporting how we'll be overrun with asylum seekers because the new goverment has changed policies. I'm calling it scaremongering because they never report on the actual total number of asylum seekers Australia gets or, for that matter, the relative amount compared to other countries. James Purser from Collaborynth mentioned earlier today that it would be great if the twitter module for Drupal could magically add hash tags (I assume based on node taxonomy terms). I've also been wanting it to be able to include the node type, so that book reviews on the LUV website don't get announced as 'New post'. With thanks to lyricnz on freenode for the right api call and Josh Hesketh for a non-ugly taxonomy fix. Kattekrab has been fiddling around with recordmydesktop for a while, working on screencasts. She was told about the key-status-monitor utility by heathenx, who already does Inkscape screencasts. This utility monitors and displays mouse button and key press status by reading /dev/input/eventX files and displays key presses and mouse clicks in a little window, which can be part of the screencast. Many community websites run Drupal and use the event module to maintain a calendar of events that they organise or that are of relevance to their members. I help maintain the website for two such organisations, Linux Australia and LUV. The event module has one slight drawback, it displays the number of hours, days, weeks or months remaining until an event. On the weekend I acquired a shiny new PCI DVB card for use with MythTV. The DViCO Dual Fusion 4 card I already had seems to have blown either one of its tuner chips or one of the USB bridges - and it's well and truly out of warranty - but the other tuner still works OK. Depending on signal strength and channel, that is. The ABC and Channel 7 generally worked OK, but the rest was iffy at best. I wasn't going to post anything about women in technology, on account of feeling particularly uninspired today. However, I came across an article in a dutch newpaper when I did my what's-happening-in-the-world round this morning, featuring a woman who manages a gas production platform in the North Sea. Suzan de Haan is not in IT, but she definitely has a tech job. You can read the relatively awful Google translation of the print version or the original page in dutch.